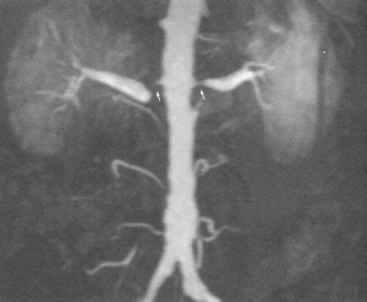 Figure 14 Contrast-enhanced MR angiogram showing bilateral severe RAS (arrows). Note the post-stenotic dilatation. Abbreviations: MR, magnetic resonance; RAS, renal artery stenosis. Source: Courtesy of Joe Brookes, The Middlesex Hospital, London. 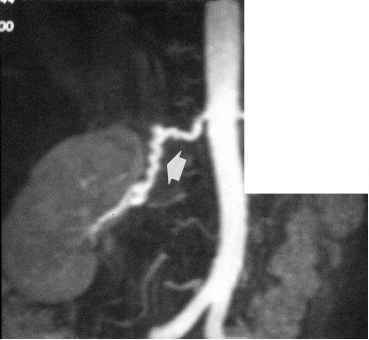 Figure 15 Contrast-enhanced MR angiogram showing the ''string of pearls'' (arrow) appearance of FMD in the right renal artery. 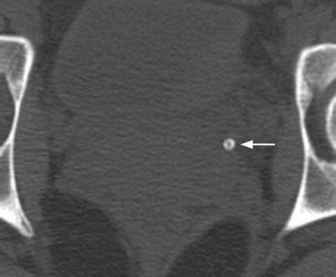 Abbreviations: FMD, fibromuscular dysplasia; MR, magnetic resonance. Source: Courtesy of Joe Brookes, The Middlesex Hospital, London. end-to-side or internal iliac end-to-end (109). Stenosis of the transplant artery is well recognized. Improved surgical techniques and immunosuppressive therapy have led to increased graft longevity. As a result, transplant artery stenosis is more of a clinical problem with an incidence of 1% to 15% (110,111), mostly within the first three years. Stenosis can occur in the recipient iliac artery, at the anastamosis, or distal to the anastamosis. Causes and predisposing factors include native vessel atherosclerosis, clamp injury, rejection, turbulence distal to the anastamosis, and surgical technique (109). Clinical pointers to stenosis include hypertension and worsening function in the absence of rejection or ureteric obstruction. Figure 16 (A) Transplant angiogram, RAO 60 projection. The transplant artery is joined end-to-side to the external iliac artery. There is a significant proximal stenosis (arrow). (B) Carbon dioxide run at the same projection. Note the poor delineation of the peripheral vessels. (C) Gadolinium angiogram taken postdeployment of a 6 mm stent. 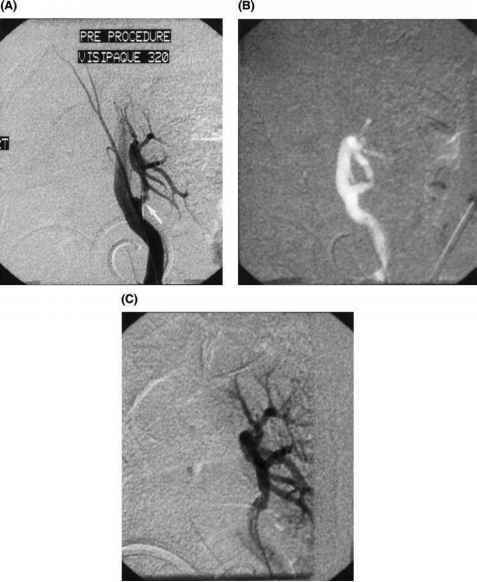 Although the opacification is not as good as conventional contrast, the renal artery branches are well seen. Abbreviation: RAO, right anterior oblique. reconstruction, or at least multiple projections, should be used to demonstrate the artery to advantage. The use of contrast agents carbon dioxide and gadolinium is limited by bolus fragmentation and poor visibility, respectively (Fig. 16B,C). 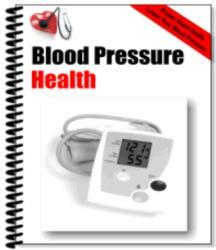 As in the native renal artery, a pressure gradient should always be sought before intervention is performed.